What is International Childhood Cancer Day? ​ Who is behind International Childhood Cancer Day? 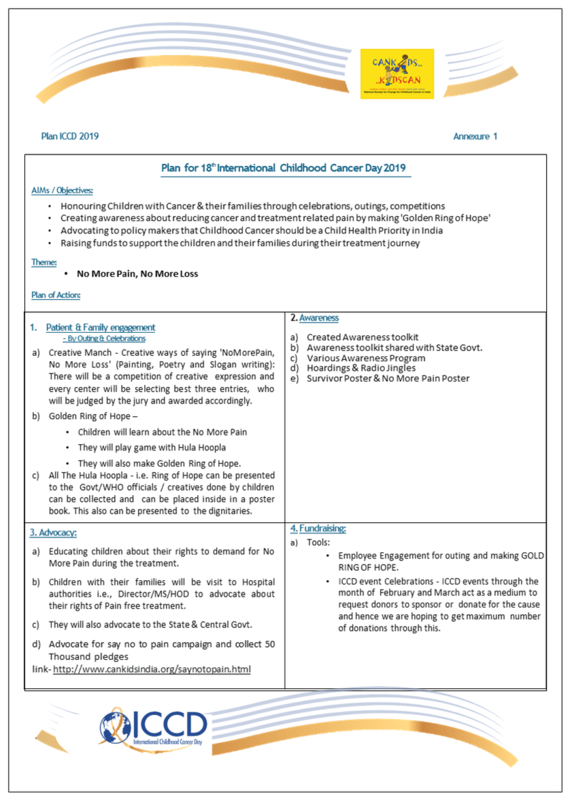 This annual event was created by Childhood Cancer International (CCI), a global network of 183 grassroots and national networks of parent organizations in 93 countries, spanning 5 continents. CCI is the largest childhood cancer patient support and advocy network. International Childhood Cancer Day is based on Childhood Cancer International’s (CCI) core belief that every child with cancer deserves the best possible medical and psychosocial care, regardless of country of origin, race, financial status or social class. It is also anchored on the premise that childhood cancer deaths are avoidable, with timely and accurate diagnosis , availability and access to proper treatment and care as well as affordable, good quality essential medicines. ICCD was first launched in 2002. Since then, the annual ICCD has generated the support of global networks and leading institutions including: SIOP (International Society of Pediatric Oncology, with 1500 plus members), SIOP Europe (European Society of Pediatric Oncologists), UICC (Union for International Cancer Control with 770 member organizations in 155 countries), St. Jude Children’s Research Hospital, and IARC (International Agency for Research on Cancer), among others. This year the coalition has further expanded to include international child focused organizations such as ICPCN (International Childrens Palliative Care Network ) and CLAN (Caring and Living Among Neighbours). Children and adolescents are the heart of every community and nation. It is our responsibility to ensure that they are able to live life to the fullest and to reach their full potentials. Sadly, childhood cancer robs our kids of their childhood and youth. It threatens and puts at risk their very survival. A cancer diagnosis shatters every sense of “normal life” for children, adolescents and their families. But even more heart wrenching than the effects of cancer on the families, siblings and parents, are the effects of cancer on the children and adolescents themselves. At the age of supposed innocence, enjoyment and pure joy, kids with cancer are faced with difficult and demanding situations, isolating them for long periods of time, from peers and friends. Most often, the cancer journey is marked by tremendous pain and stress. Thus, we believe that no child or family should go through the cancer journey alone. Today, we encourage you to STAND UP and SPEAK OUT for kids with cancer, the survivors and their families. Our challenge is to ACT NOW, because we all know that for children and adolescents with cancer, today is sometimes all that they have! Alone, we can make a difference. Together, we will create change. Together, we can help make life better for children and adolescents with cancer, the survivors and their families.